What a difference to go from Santorini and its high-society, shopping-obsessed, shoulder-to-shoulder tourists to Naxos and its laid-back locals! It’s not that there weren’t tourists in Naxos – myself among them – it’s just that they haven’t yet taken over the place. I could see Naxos being an island that a certain kind of tourist would want to skip entirely. The night life, it seems, is moderately bland, despite a preponderance of bars and restaurants near the port. However, there are no fancy jewelry shops at which to buy that diamond necklace as there are in Oia. And there are no pulsing clubs as there are in Fira. 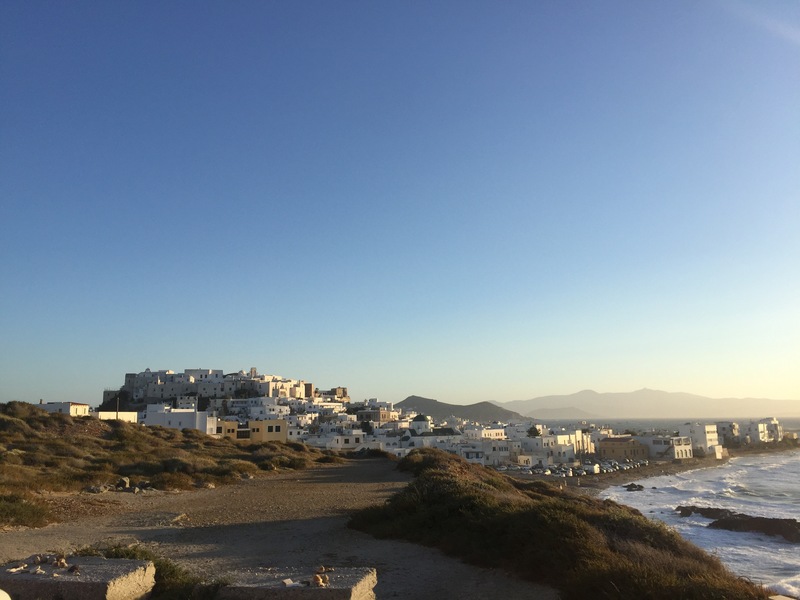 But for a person like me, mostly intent on walking, reading, and writing – or for a family looking for a calming escape – I could see Naxos being preferable to Santorini for a number of reasons. First, the beaches are sandy (not rocky, as are the best-known and frankly most awe-inspiring beaches on Santorini) and stretch for many kilometers along the west coast of Naxos. The bars and restaurants along that stretch are cheaper than in Santorini, and the accommodations are generally simpler as well. The beaches get downright quiet and offer some solitude, if you travel southward for long enough. Apart from the beautiful beaches that are easily accessible by foot, bus, or car, the labyrinth of walking streets in the town itself are a joy to explore. The castle at the top of the hill dates to the early 13th century, and the confusing patchwork of looping and sometimes dead-ended paths emanating therefrom were designed to slow down marauders while the locals barricaded themselves safely in the keep at the top of the hill. It still achieves its purposes, but on tourists instead of pirates. To be honest, though, in about four hours of wandering the hillside, I passed maybe a dozen tourists. It was heavenly to find such solitude in the labyrinth of Naxos. (Coffee and yogurt in the café atop the castle – a place called “1739” – were reasonably priced and complimented the exquisite view nicely.) On my way back down from a lengthy lunch that first day, I stumbled into the midst of a market, offerings in baskets and displayed on the walkway as well as inside a little shop. I bought fresh bread from the bakery next door and fruits from the market; in this manner, I fed myself for two of my three days in Naxos for about 5 euros (total). Total food cost for my three-night stay was about 20 euros. The sunsets were the same, beautiful sunsets as those I found in Santorini, but without most of the fanfare. No clapping. No zoo of terraces. But sheer beauty was free for all and a wonder to behold. I observed sunset first from the Gate of Apollo and from a spot slightly north and east on a hillside for nights two and three – the latter site just a few paces from Margo Suites, about which I’ve already penned the only post about accommodations I’ve ever written. All things considered, Naxos is a place to avoid if you’re looking for shopping fancy shops or for a firebrand nightlife. It’s a place to put on your list if you’re in search of something quieter and more quaint – and if you’re looking for something more akin to hospitality rather than mere service to the masses. 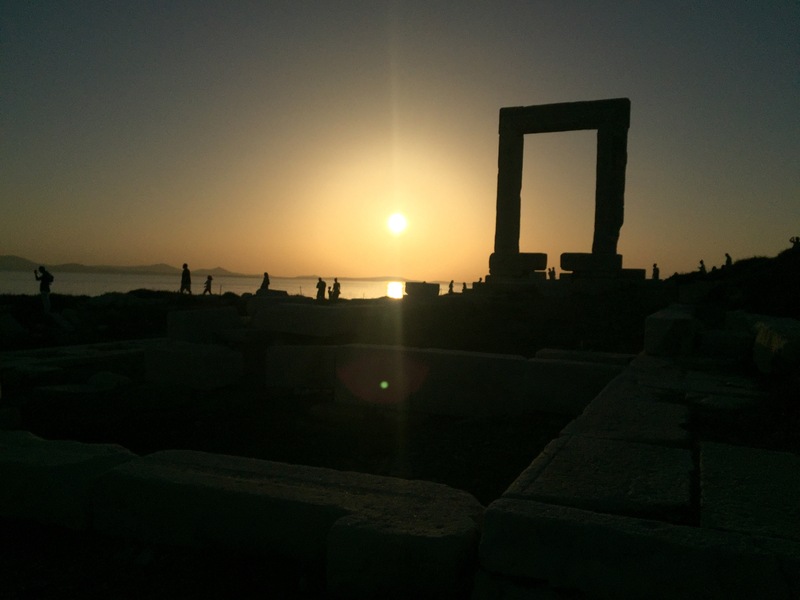 I would return to Naxos in a heartbeat, but I would not return to Santorini if I’m not on tour with someone who hadn’t yet visited (because that is surely worth seeing as well, and probably first). Remember, you can follow all of the summer’s travels from the main 2017 page! And look to the right side of your screen – you can have updates sent to your email box by wordpress each time I post something new. 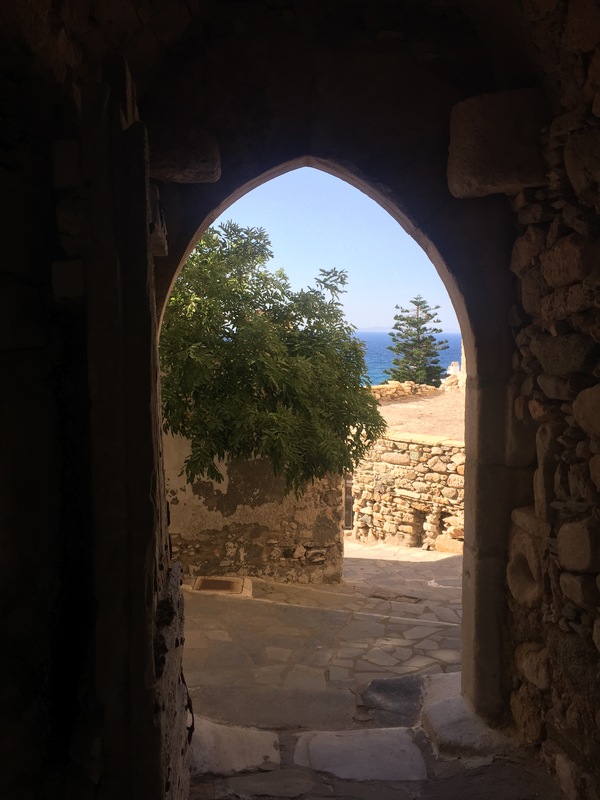 This entry was posted in Travelogue, Travelogue 2017, Travels and tagged aegea islands, aegean sea, backpacking, beaches, cyclades, europe, Europe Trip, island-hopping, kyklades, labyrinth, local culture, markets, maze, Naxos, Naxos Castle, Naxos Port, Naxos Town, Nightlife in Naxos, santorini, Slow Travel, travel, traveling. Bookmark the permalink.